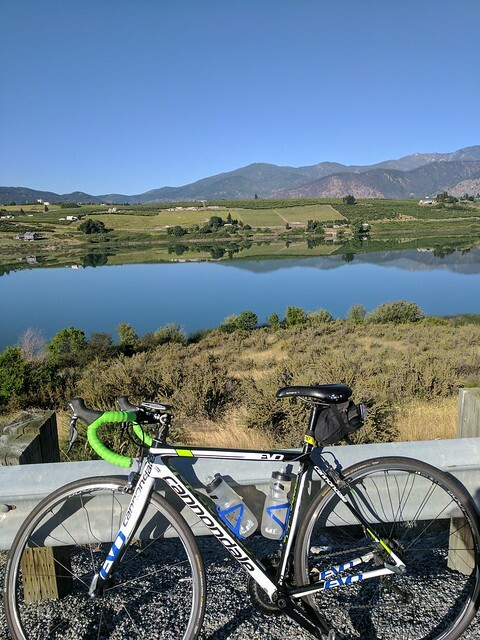 A couple weeks ago, Dad and I rode the Chelan Century. 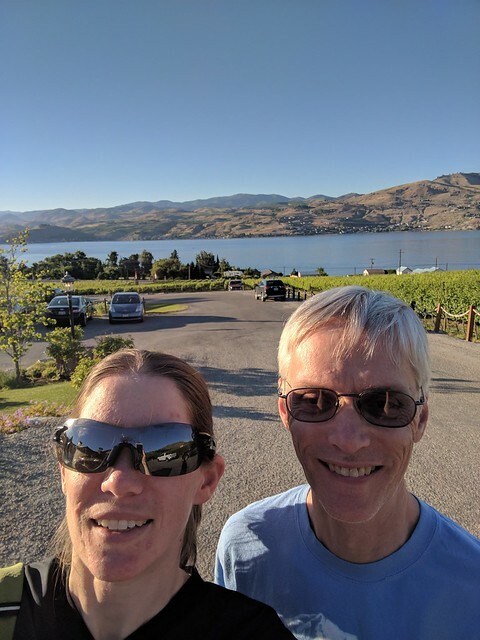 Several of our friends have spoken glowingly about it, with special emphasis on the grueling 5-mile climb called McNeil Canyon, so this year I decided to give the ride a shot and I dragged Dad along, because if I’m going to suffer, he might as well too. We do our suffering together, darn it! Anyway, the reason it took us so long to get around to doing this ride is because we both had to take time off work to drive over there the night before. 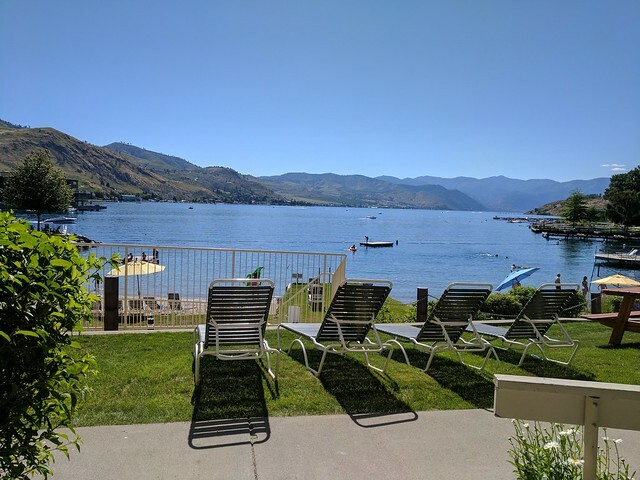 It’s in Chelan, which, with good traffic takes about 3 hours to drive from my house. With real traffic, however, we’re looking at 3.5 to 4 hours, or on Sunday afternoon, up to 7 or 8 hours. 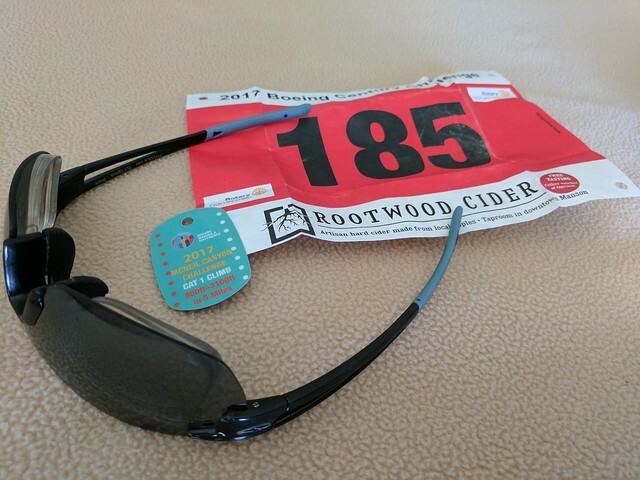 So basically you have to stay at least one night, the night before the ride; and you might want to stay the night after the ride, if you’re totally pooped. We learned quickly that reserving rooms in January for a late-June ride wasn’t on the ball enough. 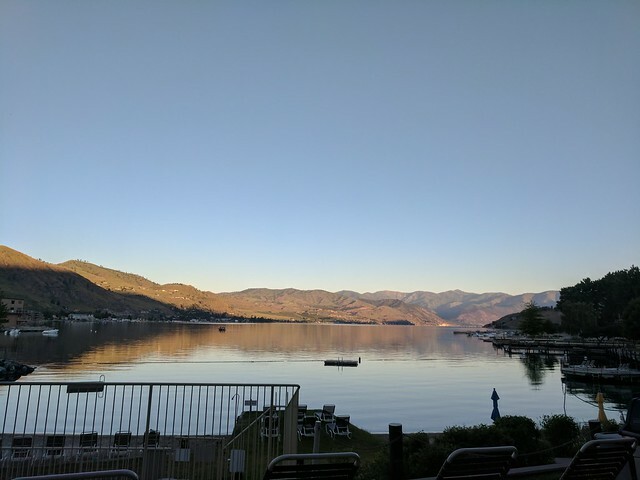 We ended up paying over $300 a night, with a two-night minimum, since it’s also the peak of the season, even though we weren’t sure we wanted to stay two nights. And the room we got was one bed with a fold-out hide-a-bed (I can attest to the inadequacy of the mattress in that department–or at least all my bruises can! ), right on the water–theoretically wonderful, but not actually ideal for sleeping while everyone else was up playing in the late sunshine. 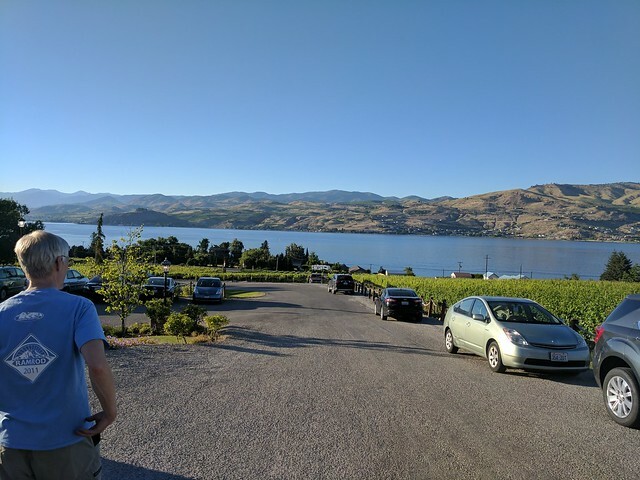 In any case, we drove over to Chelan and arrived late afternoon, and it was beautiful. We got our numbers and free swag (coffee, which I brought to work and left in the kitchen, and which vanished almost instantly) at the Chamber of Commerce. 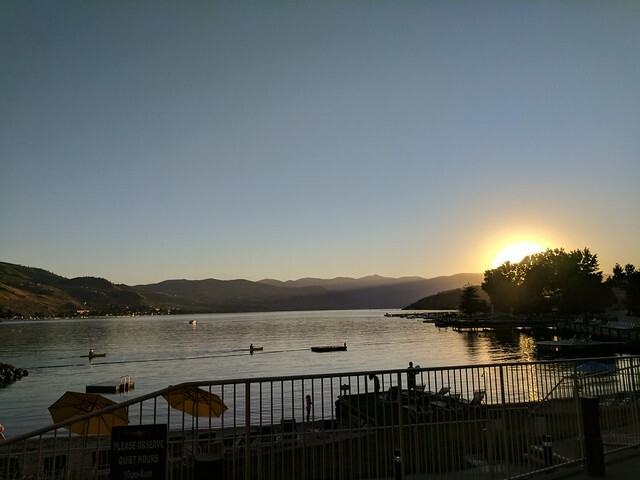 I bought a couple things (a ton of ear plugs, since I forgot mine and they don’t come in small numbers, and a book for Benji) and then we went to dinner with our biking buddy John and his family at this restaurant that had really beautiful views. The beautiful views theme continued in the evening and the next morning before we left. Early in the ride Dad got a flat tire, but he got it changed quickly and we got more nice views while we waited. So we rode along and I was really careful about pacing myself, because I knew this big climb was coming about halfway through the ride. It also was getting warmer and warmer, so Dad and I both made sure to drink a ton. We rode with our biking buddy John Jester, who has gotten super strong this year but still patiently waits for us at the top and bottom of hills. It was a relief to finally get to McNeil and ride that big hill, because at least then it was done! I had kind of hoped to get the fastest time on that climb, either of women on that ride or of all time; but neither happened. I was satisfied with my effort — about 51 minutes — and that’s good enough. Some time I may want to go out and ride around there on my own, and try to hit that hill harder and faster, but for a mid-century ride where I had to save my legs for another 50 miles and 4,000 feet of climbing, it was decent. 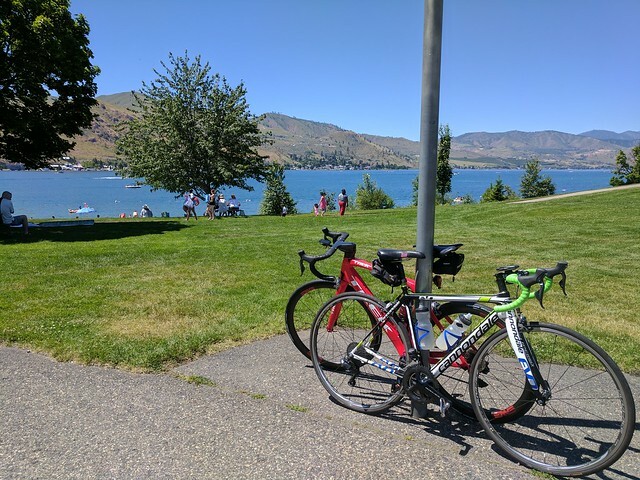 The ride was split into three loops, each 35 to 40 miles long, each starting and ending at a park in downtown Chelan. This works OK, and I was fine with coming back to the cooler area around the lake each time. That’s John’s red bike. He likes red vehicles. So then it was another 30-odd miles, and the temperature kept going up, until I saw 102 F on my bike computer (John’s said 99.8, but I’m going with mine). It felt like getting cooked. I was really very ready to be done; John rode away from us at the end but Dad and I stayed together and slogged through the last 10 or 15 miles, drinking a ton of water and stopping at every water stop along the way. It was HOT, and the pleasant mid-70s temperatures on our previous rides hadn’t prepared us for being SO DARN HOT. 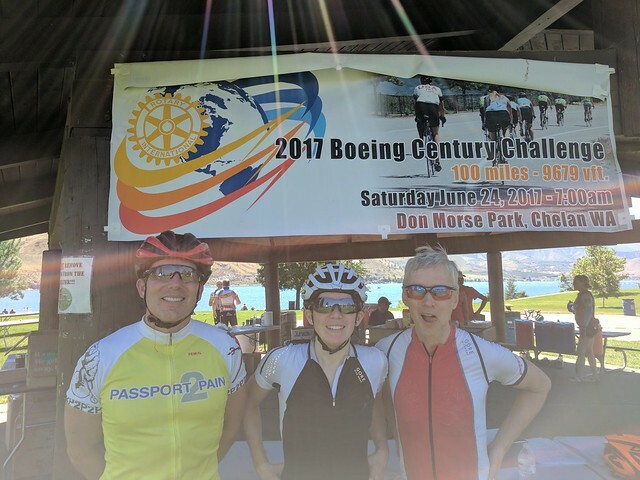 We finished: 102 miles and about 9500′ of climbing. There were two bonus climbs that we skipped, thank goodness; I don’t know that my legs had another 1000′ of climbing in them. This is us together at the end: John on the left, me, and Dad. It’s a representative, if not overly flattering, photo of how it felt at the end of the ride. Dad and I showered and rested in our room, but ended up deciding to drive back home that night. So we did. It took, as anticipated, about 3.5 hours, after which I really didn’t want to drive anymore. There were some great aspects to the ride. I liked riding somewhere new, with roads I haven’t seen a zillion times. I liked the seriously long climbs that take more than 5 or 10 minutes to get up. I liked the views and the lack of traffic and stoplights. I liked the support, which was phenomenal. The ride was expensive, not only in money (although if you add up the registration fee, all the driving-related expenses, the food [no free food at the end! 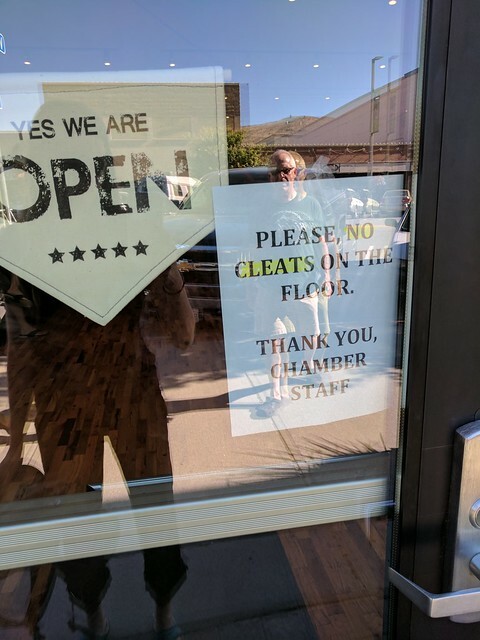 I had to pay $5 for a sandwich! ], the room, etc., it would certainly come out as one of the spendiest of my recent rides) but in time and in family resources. While I was gone, Ian spent all Friday evening and all of Saturday with Benji. I had to take time off work. I was away from my family for an overnight, just doing a play thing. The ride also felt brutal in a way that I didn’t enjoy. I like hard rides–very hard ones. RAMROD isn’t for wimps, nor is Passport2Pain, and yet I’ve done the former twice and the latter three times (and I’m signed up for a fourth). But between the extreme amount of climbing–nearly as much as RAMROD–and the extreme temperature, it just felt deeply miserable by the end. I guess what I’m saying is that it felt extreme for no particular reason, whereas something like RAMROD has a fabulous reason: Mt. Rainier. Or P2P: Get passport stamps, see beautiful views. This, by the way, is why something like the Death Ride doesn’t appeal to me at all. I’m not interested in doing rides where people regularly die; I just want to push myself and have fun. 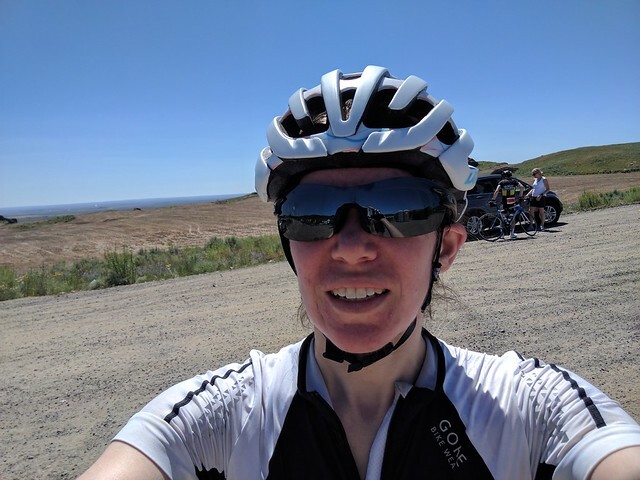 It’s also difficult to be well trained for a ride with almost 10,000 feet of climbing by the end of June, when serious ride training doesn’t start until March or April. This year it was later than that, with all the terrible weather we had. That’s really my issue, not theirs, of course. Anyway, overall, I am very glad I did the ride. However, I don’t think I will feel a need to add this to my (very short) list of annual rides.